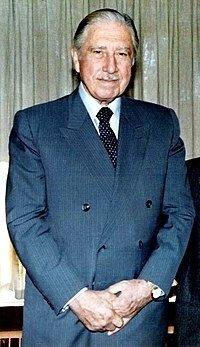 Augusto José Ramón Pinochet Ugarte (born 25 November 1915 – dead 10 December 2006), was a Chilean general and dictator of Chile between 1973 and 1990 and Commander-in-Chief of the Chilean Army from 1973 to 1998. He was also president of the Government Junta of Chile between 1973 and 1981. Media in category "Augusto Pinochet"
This page was last edited on 29 October 2018, at 11:41.